Gianfranco Zola's reign as West Ham United manager ended on Tuesday. 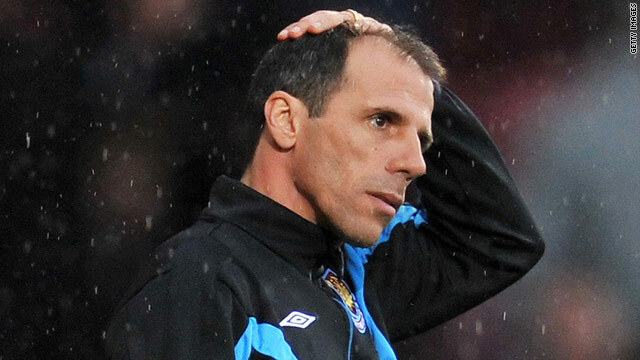 (CNN) -- Italian manager Gianfranco Zola has been sacked by English Premier League club West Ham, while former England boss Steve McLaren has joined German side Wolfsburg. The Hammers announced in a statement on their official Web site that they had terminated Zola's contract after a season in which they finished just one place above the relegation zone. West Ham's new owners, David Gold and David Sullivan, who took control of the club in January, made clear there would be changes at the end of the season, and they have been true to their word. The official statement read: "West Ham United confirm that they have terminated the contract of Gianfranco Zola. Meanwhile, ex-England coach Steve McLaren has been confirmed as Wolfsburg's new coach. McLaren led Dutch side FC Twente to their first ever league title last season and will become the first English coach to take charge of a German side. A statement on Wolfsburg's official Web site said: "Steve McClaren is to take over as new trainer at VfL Wolfsburg. The 49 year old will start work on July 1st under a two year contract to keep him in Wolfsburg until June 30th 2012." Former Netherlands and Ajax coach Marco van Basten has ruled himself out of the running to become the next boss of Italian giants AC Milan. Media reports in Italy claim current coach Leonardo will leave the club in the summer but according to the UK Press Association, Van Basten told Italian television that a serious ankle injury would rule him out of contention. He said: "I am still not ready. I still have an ankle problem and I must resolve it. I can't do a big job like that of a coach as for that your mind has to be clear. "I have read the reports about Milan and me. It's a good idea. Milan and the people of Milan are kind to me, but right now I have this problem with my ankle and it doesn't seem right to see a coach limp on the pitch."